First we collect and analyse all available information about your document output infrastructure to establish a baseline of your current carbon emissions, taking paper and energy consumption into account, to assess the right approach for your environment and future needs. We then formulate a plan that clearly identifies key areas for improvement, incorporating your own management commitments, ambitions relating to process efficiency, cost optimisation and productivity improvement. Practical steps include new floor plans for energy efficient device placement, and a report that sets out the path to achieve solid KPIs to track and measure tangible results. The next phase is the implementation stage of the agreed blueprint, covering the installation and setup of devices like multifunction printers that include duplex printing and power saving modes. Training is offered to raise environmental awareness, teach energy-efficient device operation and communicate the impact that simple changes like double-sided printing can have. We then begin to monitor results and measure them against your baseline and the sustainability KPIs set out in the design phase. We provide you with regular reports along with recommendations to improve processes if we observe negative variance and replicate successes where departments outperform targets. Targets may also be redefined if necessary to calibrate the sustainability performance of your fleet. Our solution aims to reduce the environmental impact of all activities within our control. However even with the most sustainable process, there will be remaining carbon emissions produced by unavoidable paper and power use and device maintenance. Using our British Standard Institution accredited calculation method, we translate the remaining impact into hard figures and offer a choice of carbon credits to help you achieve a zero footprint target. 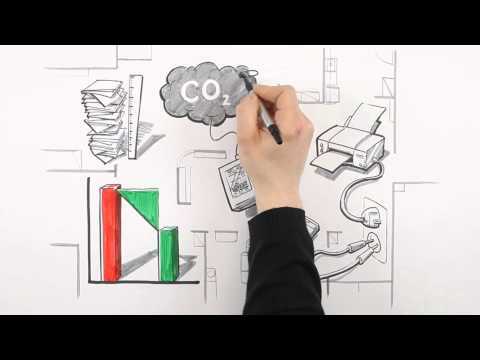 Ricoh’s Sustainability Optimisation Programme provides you with a practical, structured, measurable approach to neutralise the carbon footprint of your document workflow. A pragmatic, actionable sustainability policy has become a crucial part of the business agenda in recent years. The rising cost of energy and its impact on the bottom line is only one factor. A solid sustainability strategy is of crucial importance to remain competitive as customers and partners seek assurances that you do business in a responsible way. Beyond the clear environmental benefits, the implementation of the Sustainability Optimisation Programme offers organisation-wide productivity and cost saving advantages. Sustainable working includes the implementation of energy-efficient hardware, waste-reducing software and environmentally aware work patterns. All of which have a direct impact on your bottom line and the way people perform within your organisation. The Ricoh Sustainability Optimisation Programme draws on an extensive pool of experience in analysis and implementation. Through our British Standards Institution certified Sustainability Optimisation Programme, we’ve to date (June 2016) completed over 10,000 green audits for customers ranging from small businesses to multinational enterprises across Europe. We’ve helped our customers achieve demonstrable results, with an average reduction of 34% in carbon emissions and a 31% reduction in their TCO. Helped the company achieve significant and sustainable reductions in its carbon footprint by almost 3 million kilograms per annum. The challenge - The organisation’s print and reprographics infrastructure had grown organically. A fleet of stand-alone printers was proving expensive to run and provided little control over usage. Print volumes were growing and, with the company using inefficient equipment, carbon emissions were higher than necessary.